This did not bother me as much as you might think – I hardly knew my parents. They were a whirling pair of dancers in a photograph my aunt kept on her mantelpiece. There was a jazz band in the corner of that photo, and I’d always been more taken by the man playing the trumpet than my mother’s gauzy scarf or my father’s goofy grin. Bronte has grown up in the care of her aunt Isobelle and The Butler. But now her parents have died, and their will has been read. Bronte has adventures to have, whether or not she wants them. She also has gifts to distribute, before finding her way to the party to celebrate the lives of the parents she never knew. 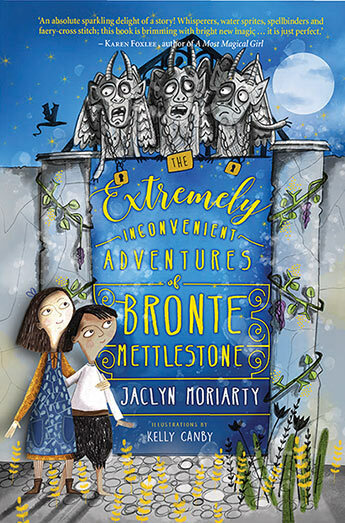 ‘The Extremely Inconvenient Adventures of Bronte Mettlestone’ is chock full of intrigue and unusual encounters, and although Bronte is a reluctant adventurer, she is an intrepid one. Like the title, this is not a short novel, but it is as full of deliciousness and fun as any favourite cake. Recommended for competent middle-primary readers, and as a read-to for younger readers.